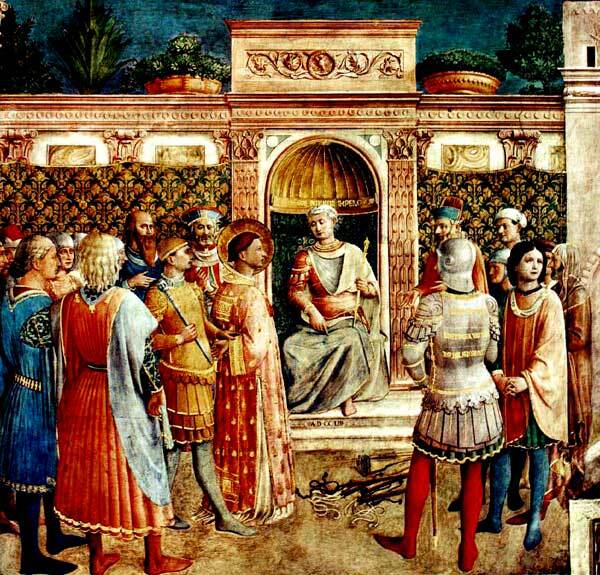 Jun 1 – St Justin Martyr, (100-165 AD) | ADULT CATECHESIS & CHRISTIAN RELIGIOUS LITERACY IN THE ROMAN CATHOLIC TRADITION: hosting ONLY True Christians!! !, or "How to think Catholic!!" All the voices around Justin clamored that they had the truth he sought so desperately. He had listened to them all since he first came to Rome to get his education. They each shouted that they held the one and only answer but he felt no closer to the truth than when he had started his studies. He had left the Stoic master behind but the Stoics valued discipline as truth and thought discussion of God unnecessary. He had rejected the Peripatetic who seemed more interested in money than discussion. The Pythagorean had rejected him because he didn’t know enough music and geometry — the things that would lead him to truth. He had found some joy with the Platonists because the contemplation of ideas gave wings to his mind, but they had promised wisdom would let him see God and so, where was God? There was one place that Justin always escaped to in order to get away from these shouting, confusing voices and search out the quiet inner voice that led him to truth. This place was a lonely spot, a path that seemed made for him alone in a field by the sea. So sure was he of the isolation of his retreat that he was shocked one day to find an old man following him. The old man was not searching for truth but for some of his family. Nonetheless they began a discussion in which Justin identified himself as a philologian, a lover of reason. The old man challenged him — why was he not a lover of truth, a lover of deeds. Justin told him that reason led to truth, and philosophy led to happiness. This was certainly an interesting thing for Justin to say since he had not found the truth in the study of reason or happiness in his quest among the philosophers! Perhaps the old man sensed this for he asked for Justin’s definition of philosophy and of happiness. In the long discussion that followed, Justin spoke eloquently to the old man’s searching questions but even Justin had to admit that philosophers may talk about God but had never seen him, may discuss the soul but didn’t really know it. But if the philosophers whom Justin admired and followed couldn’t, then nobody could, right? The old man told him about the ancient prophets, the Hebrew prophets, who had talked not of ideas but of what they had seen and heard, what they knew and experienced. And this was God. The old man ended the conversation by telling Justin to pray that the gates of light be opened to him. Why hadn’t Justin known about Christianity before with as much as he had studied? He had heard about it, the way other pagans of second century Rome had, by the rumors and accusations that surrounded the persecution of Christians. The fearlessness of their actions made him doubt the gossip, but he had nothing else to go by. Christians at that time kept their beliefs secret. They were so afraid that outsiders would trample on their sacred faith and desecrate their mysteries that they wouldn’t tell anyone about their beliefs — even to counteract outright lies. To be honest, there was good reason for their fears — many actors for example performed obscene parodies of Christian ritual for pagan audiences, for example. But Justin believed differently. He had been one of those outsiders — not someone looking for trouble, but someone earnestly searching for the truth. The truth had been hidden from him by this fear of theirs. And he believed there were many others like him. He exhorted them that Christians had an obligation to speak of their faith, to witness to others about their faith and their mysteries. Justin never ended his quest for religious truth even when he converted to Christianity at the age of thirty after years of studying various pagan philosophies. As a young man, he was principally attracted to the school of Plato. However, he found that the Christian religion answered the great questions about life and existence better than the philosophers. Upon his conversion he continued to wear the philosopher’s mantle, and became the first Christian philosopher. He combined the Christian religion with the best elements in Greek philosophy. In his view, philosophy was a pedagogue of Christ, an educator that was to lead one to Christ. Justin is known as an apologist, not someone who apologizes, but rather someone who defends in writing the Christian religion against the attacks and misunderstandings of the pagans. Two of his so-called apologies have come down to us; they are addressed to the Roman emperor and to the Senate. He also opened a school of debate in Rome. Naturally, he came to the attention of the Roman authorities. Justin was arrested during the persecution of Emperor Marcus Aurelius along with four other Christians: Chariton, Charites, Paeon, and Liberianus. ~ Justin Martyr, apologist, Saint; in answer to the Prefect Rusticus who had demanded sacrifice to the Roman gods; from the trial transcript by Tatian (A.D. 165).